The Legendary shooter, now for iPhone and iPod touch! CAVE has released a new iPhone 2D shooter game called 'Dodonpachi Resurrection' which can already be downloaded on iTunes App Store. The game which is a sequel to 'Dodonpachi Daioujou' comes with two fully-featured game modes: iPhone Mode, an exclusive adaptation tailored to the iPhone/iPod touch portable format, and Arcade Mode, a port of the arcade shooter classic. Rankings are included for each game mode and each ship type. You can compete with players all over the world for high scoresand unlock achievements by completing in-game challenges. Dodonpachi Resurrection will only run on iPhone4, iPad, iPhone 3GS and 3rd Generation iPod touch (Late 2009, End 2009 32 GB and 64 GB) devices. 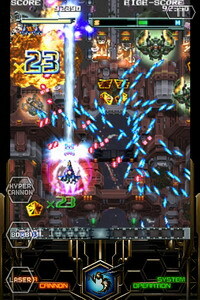 Dodonpachi Resurrection for iPhone is available for download $8.99 on the App Store in the Games category. 0 comments on "Dodonpachi Resurrection iPhone game available for download"